Did Binyamin Netanyahu Predict 9/11? 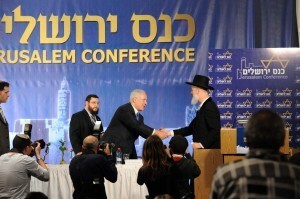 Binyamin Netanyahu at the Jerusalem Conference in January 2009. On CNN in November 2006: "I wrote a book in 1995, and I said that if the West doesn't wake up to the suicidal nature of militant Islam, the next thing you will see is militant Islam bringing down the World Trade Center." To the Jerusalem Conference in January 2009 (at 12:57 into his speech): "Look, I wrote ... in 1995 … that radical Islam will topple the Twin Towers." What road should the United States and other democracies pursue if they are to overcome not only the domestic terror of Oklahoma City but the potentially much more insidious international terror which produced the  World Trade Center bombing, and which may very well produce other such tragedies before it has been defeated? Iran might be tempted to actually use nuclear weapons against Israel or a neighboring Arab state, and then avoid the consequences of Western reaction by threatening to activate its pre-armed militants in the West. … In the worst of such scenarios, the consequences could be not a car bomb but a nuclear bomb in the basement of the World Trade Center. A nuclear bombing of the twin towers would have rendered all of New York City uninhabitable for generations; the two airliners on 9/11 brought down the World Trade Center and destroyed near-by buildings, but otherwise New York City remains very much inhabited and alive today, a dynamic world capital. Comments: (1) Neither passage predicted "militant Islam bringing down the World Trade Center" nor "radical Islam will topple the Twin Towers." Verdict: Netanyahu did not predict 9/11.